San Antonio: On My Bucket List! 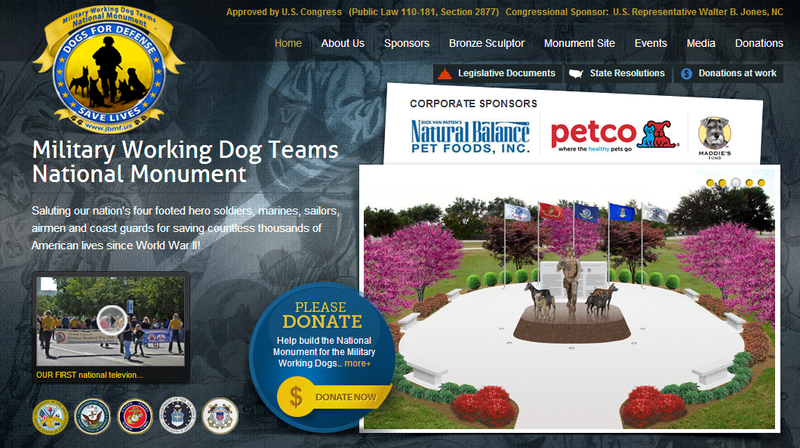 Many of you may be aware of the Military Working Dog Teams National Monument that Natural Balance is sponsoring. This is the first time in U.S. history that dogs have been elevated to national monument status by a congressional law. We're finally realizing their significant contribution to our nation's security. In October of this year, the National Monument will be dedicated at Lackland Air Force Base in San Antonio, TX, where the military working dog teams are trained. The installation and maintenance of the monument will be very costly. Natural Balance, in partnership with the Petco Foundation, will be investing heavily in this effort and would like to invite you to participate if your heartstrings are tugged. Families of service members who have been touched by working dogs may find this a way to pay homage to the canines that have been a part of their family history. Oliver Loves the L.I.T. Jerky Bark! As an NB Insider, All Things Dog Blog shares news, events and product information with you. In exchange I am compensated with Natural Balance Organic Formula food for my dogs and sponsored travel to industry events. Pawsome! We will probably go visit our family in Austin this holiday, which means about 1.5 hours from San Antonio! That is great! I will definitely buy some of these treats to help!